If your backyard flock could use some size, why not consider emus? The emu is the largest bird in Australia and second largest in the world, the first being the ostrich. They are flightless birds and quite a popular commodity these days all over the world. They stand up to 6.2 feet in height and lay beautiful blue-green eggs. They make great pets, egg producers, predator control, and food for the table. Emus have not always been popular, especially in their native Australia. In 1932, the emu population had exploded, causing massive crop destruction and they were considered a nuisance in western Australia. A military operation was devised to try to minimize the population, and this ended up being called the Great Emu War. (It was not successful.) The unpopularity didn’t last long, however. As emus were imported into various countries, many nations have been successful with emu as a food source. The emu is 95% usable, therefore there is barely any wastage to the bird. Emus are great feed converters. For every 2.5 pounds of feed, there is one pound of gain, making them great meat choices for some farms. With these statistics, the emu became a business model for investments. Emu oil is a sought-out emu product, as well. Emu oil is mainly fat collected from deposits below the skin. When refined it is used in face creams, soaps, and other cosmetics. The use of emu oil started with the aborigines and passed on to the European culture as natural sunscreen and moisturizer. Emu oil is high in omega-3, -6, and -9 fatty acids, and also contains vitamin A, which is an antioxidant and essential nutrient, acting as a skin tonic. Although it remains unproven, many professionals do believe that emu oil has properties that help with arthritis, as an anti-inflammatory, and helping reduce cholesterol. More trials and tests still are needed, though. Now that emus have become less of a zoological oddity and more of mainstream livestock, the benefits of emus are now being fully explored, such as predator control, egg art, and pets. Emus are known for warding off unwanted predators. There have been cases of emus stomping bobcats, opossums, snakes, and neighborhood cats to the ground. Famers have been utilizing this behavior to enforce more livestock protection, as emus can get along well with horses, donkeys, goats, and small animals they have been raised with. Not all emus will do this, however. The emu egg is a very large blue-green egg averaging close to one pound in weight. In comparison to chicken eggs, an average of 10-12 chicken eggs will equal one emu egg. Emu eggs are sought for egg art. Many artisans enjoy carving and painting emu eggs and selling them at art exhibits. Lately, the pet market for emu seems to be the newest trend. Many people enjoy obtaining chicks and raising emus or hatching the eggs to start with them from day one. Compared to ostriches, emus are more docile, but caution must always be taken when dealing with larger birds as not all emu are friendly. • Breeding season is during the winter time in the U.S. (which is Australia’s summer time). Eggs are laid between November- April/May. • Emus do not fly. They have a vestigial wing with a nail at the end, but they do use their limbs to balance themselves during running. • The legs of an emu are the most important. Without proper leg structure, they cannot function. Emus can run up to 31 miles per hour, with some clocked at 75 miles per hour. • Unlike chickens and other poultry, the male emu is the nurturer and will incubate and brood their young. • A group of emus is called a Mob. • Emus come in three colors. Commons (wild-type), Whites, and Blondes. The Whites and Blondes are harder to obtain but they are out there! One can obtain emus online by purchasing hatching eggs, chicks, juveniles, and breeding adults. 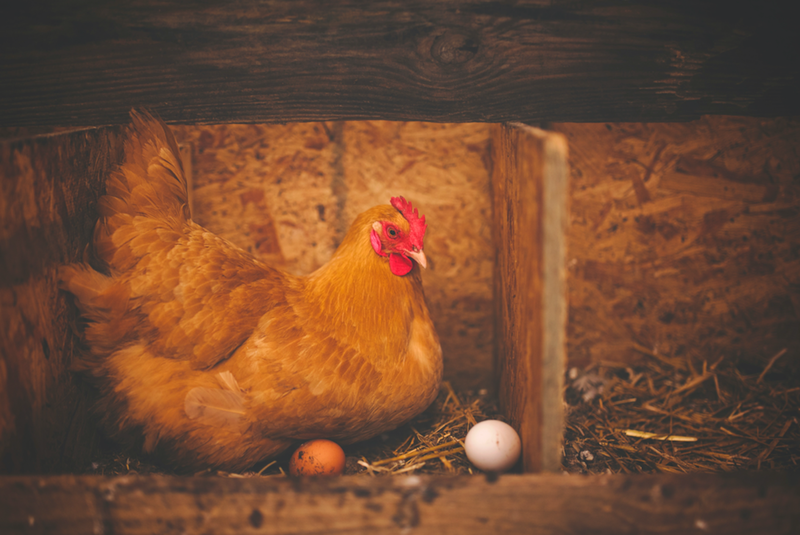 The most common practice is to purchase hatching eggs and chicks—they need to acclimate to your environment from day one, especially if you are raising them with other species. Please be advised that emus generally are shipped via a transport service to ensure proper safety. Therefore one may need to search locally if the cost of transport is not an option. Although hatching is always exciting, just because one has an incubator does not mean that an emu is meant to be in the household. An emu (as a pet or breeding bird) has a lifespan of 30 years if not more, and therefore a commitment is needed. They do have specific needs to ensure they have a happy and long life. Housing and fencing—Emus do not require elaborate housing, but a shelter is recommended to keep birds out of the elements. Because emus love to jump and run (they tend to be silly at all stages of life), the more space to roam, the better. Many breeders house pairs in 1000 square feet of space per pair of emu. An acre of land can house about 10 pairs with room to roam. Emus do pair up during the breeding season and breeders have more success letting the emu choose their mates to make production more successful. Females can get aggressive towards extra males, therefore make sure that there is adequate space just in case separation is in order. There have been cases in which adult male emus will lose interest in their mates if a juvenile or emu chick is nearby, therefore it is recommended to house juveniles and chicks away from breeding pairs. Emus are notorious for climbing up fences, not jumping, so a good fence of at least six-feet tall is recommended. Some breeders will use an 8-foot-tall fence to be on the safe side. Nutrition—Emus are omnivores; therefore, they eat plant life and vegetation, but also animals as well. They are similar to chickens and turkeys when comparing digestive tracts. Their gut function is very efficient compared to ostriches, being able to digest food in 6-8 hours vs. up to 48 hours for an ostrich. 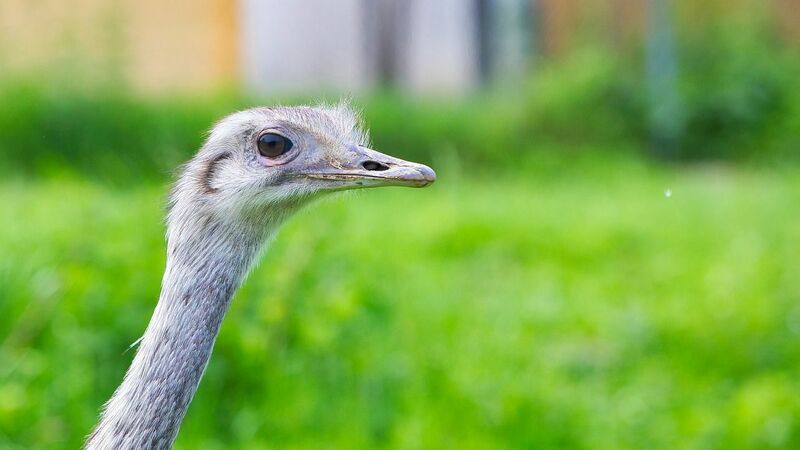 An adult emu will consume 1.5 to 1.75 pounds of feed a day. The males tend to eat less during the breeding season. A good ratite formula is needed to keep the emu in good shape. 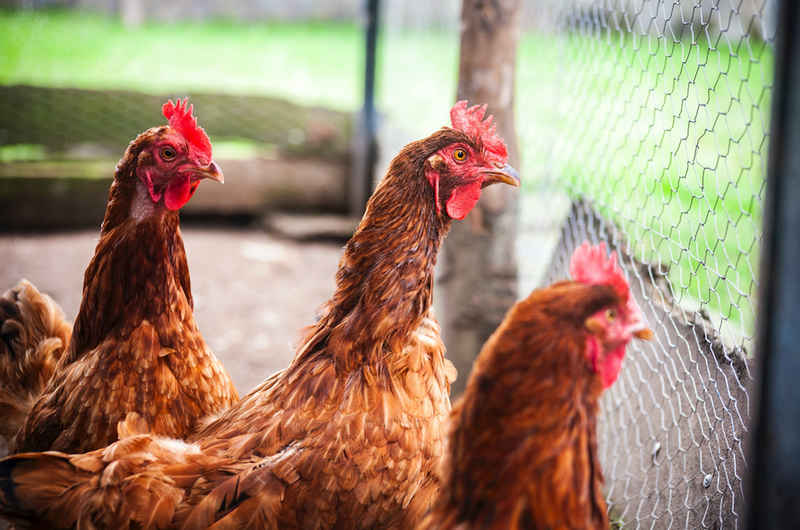 There are many opinions on what that would entail, as not many feed stores will carry a ratite starter, breeder, and maintenance formula, which are needed for well-rounded nutrition. A typical adult emu formula consists of 14-17% protein. Many breeders and farmers mix their own ration. Do note that emus are naturally deficient in vitamin E/Selenium and B12, so it is recommended to offer breeders and chicks food, vitamins, and sometimes monthly shots that contain the two vitamins. Otherwise you run the risk of developing leg and neck issues (splay leg and wry neck) in the flock. Incubation—Emu eggs can be incubated in various types of incubators, the most common being cabinet incubators. Many have had success incubating and hatching in smaller models, such as the Hova-Bator Genesis. Emus have their own unique requirements compared to other species. • The incubating time for emu eggs is 49-55 days, with the average being 52 days. It is a long wait but worth it. The emu eggs cannot be candled, therefore in order to know if the egg is viable, weights are recorded weekly. A percentage loss of 1% a week is a good indicator the emu egg is viable. Another is the wiggle test. By 35 days, emu eggs will wiggle on a hard surface (because it takes longer for them to chill, this does not harm them). Tap-testing with a metal rod is an additional viability test, but it takes practice to hear the difference in sounds. • The temperature needs to be lower than poultry and game birds. The recommended temperature is 96.5-97.0 degrees F. The temperature is very important. Many have incubated eggs as low as 95.5 degrees with success, but this takes longer. The days take longer but the chicks thrive as well as if incubated at a slightly high temperature of 97.0 degrees F.
• Humidity needs to be lower than other species. A recommended humidity of 25-30% has had proven success. Higher humidity causes drowning of the embryos. Brooding—Once the emu chicks hatch, they won’t have an appetite for a week because they have such a large yolk sac. Make sure their brooder is lined with a non-slick liner to prevent splay or straddle leg. A towel or nonstick shelf liner works well to start off with. Remember, the legs are the most important part of the emu, therefore prevention is key. It is hard to fix leg issues in emu chicks and usually it requires euthanasia, unfortunately. Environment is the number one killer for the birds, therefore start it right and avoid problems later. Emu chicks are vulnerable to predators while they are small. It is important to keep them safe for 4-5 months. After six months, the birds are large enough to take care of themselves. Emu chicks require a ratite starter, along with fresh greens (kale and spinach) to help with the vitamin deficiencies they are prone to having. Emus are wonderful birds, unique in many ways, and offer many well-rounded and well-regarded benefits. With ample knowledge on the birds, as well as an open mind to all the qualities they contain, one can be very successful with raising emus. After all, they supply the meat, cosmetic, art, predator control, and pet markets.